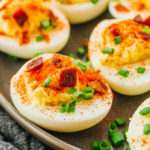 These keto deviled eggs pack a ton of flavor into each bite: a spicy mustard filling, topped with paprika, chives, and crispy bacon. They're suitable for low carb, keto, paleo, and gluten free diets. Add 1 cup of water to the pressure cooker pot. Place a trivet, steamer basket, or specialized egg rack inside the pot. Place eggs on top. Secure and seal the lid. Cook for 5 minutes at high pressure, followed by 5 minutes of natural release. Manually release remaining pressure. Uncover. Transfer the eggs to a colander and rinse under cold water for a few minutes. Place the eggs in a pot. Fill with cold water to about 1 inch above the top of the eggs. Bring to a boil over high heat and let it boil for 1 minute. Remove the pot from the burner, cover with a lid, and let sit for 15 minutes. Strain out the eggs and transfer them to a colander. Rinse under cold water for a few minutes. If bacon is uncooked, place the bacon slice on a pan over medium heat. Cook until crispy, turning the slice occasionally to fry both sides. Drain the slice on a paper towel lined plate. When cool, crumble into small pieces. Set aside. When the eggs are cool enough to handle, peel and then slice each egg lengthwise. Carefully scoop or pop out the egg yolks into a large mixing bowl, and mash them. Add mayonnaise, mustard, salt, and pepper. Mix until smooth. Using sriracha in its squeeze bottle, squirt about 1/4 teaspoon of sriracha onto each empty egg white. You can use less or more, depending on how spicy you want them to be. Scoop the egg yolk mixture into a small sandwich plastic bag. Cut off a tiny corner of it, and use this to pipe the filling over each egg white. Garnish with paprika, fresh chives, and crumbled bacon. Refrigerate the deviled eggs, and serve chilled.